The Port of Tacoma (based in Washington State) is the fifth largest water port in the United States and holds containers, automobiles, grain, and logs prior to transport. Washington State has some of the most strict stormwater regulations in the United States, so all goods and traffic coming in and out of the port are carefully monitored. Log yards are of particular concern as stormwater runoff can be contaminated with metals, organic pollutants, and particulate matter associated with log processing. The West Hylebos Log Yard at the Port of Tacoma is a 25-acre yard that debarks and sorts logs prior to their export (millions of board feet of lumber and logs are shipped each year). Debarking the logs is part of the Port’s pest control strategy, but debris from the process and the heavy traffic at the log sort facility made conventional best management practices unfeasible when the Port had to upgrade existing stormwater infrastructure to meet new regulations. The Port of Tacoma, working with the company, Kennedy/Jenks Consulting, considered various water treatment options. Aggregate data from that analysis identified biofiltration as a solution that was both cost-effective and the best fit for the West Hylebos Log Yard requirements. 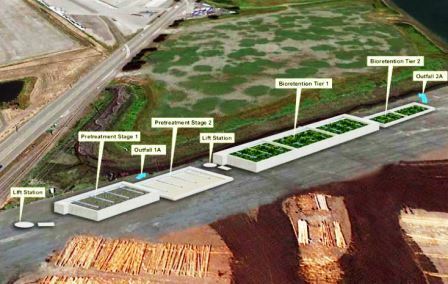 This system, created by the Port and Kennedy/Jenks Consultants, uses biochar as one of the components for filtration. Pea gravel filter: this first pretreatment filter uses physical filtration to settle out large solids and particulates. Sand and biochar filter: the second pretreatment filter targets fine solids, metals, and organic contaminants. The filter is made up of a mixture of 30% biochar and 70% gravelly sand. When looking at economics, the project found strong cost effectiveness by using biochar in lieu of other filtration mediums (like Activated Carbon); the biochar cost $200 per cubic yard. Two sand and compost filters planted with bamboo: stages 3 and 4 include biofilters that use physical filtration and biological processes to remove the remaining pollutants. In each of the filtration stages, stormwater is distributed evenly over the surface of the media. It flows through media, gravel and drain-rock layers into under-drain pipes and is conducted to lift stations where the water is distributed over the next filtration stage. The hydraulic system was designed for even contact with filtration media and uniform hydraulic performance. It includes features that allow the two biofiltration stages to operate in parallel and to accommodate heavy storm events. With testing, the LID biofiltration system reduced contaminants in the log yard stormwater for all monitored parameters. The stormwater that flowed from the system contained 92% less zinc, 81.3% less copper; turbidity was reduced by 94%; and it tested for 85% percent fewer suspended solids than the water prior to filtration. This project allowed the log yard to exceed required new water quality standards during a time in which log yard activity increased. 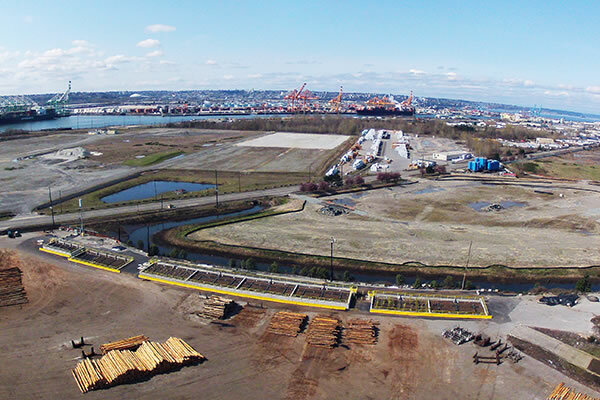 The project satisfied community and stakeholder requirements for a cost-effective and environmentally friendly solution that supports Port of Tacoma business development.